Adelyn Zhou, CMO at Topbots, gives us some insight into the world of marketing bots and what are the common mistakes companies releasing products in this space are meant to avoid. The time has come! You and your development team have put weeks of effort perfecting your new chatbot and are finally ready to unveil your creation to the world. But building a bot is just the first step. There are tens of thousands of bots on Facebook, Slack, WeChat, and other popular messaging platforms, and only a handful have gained widespread adoption. Most bots have barely even been used. Improve your odds of success by making sure you avoid these common bot marketing blunders. What do you want to achieve with your bot? Do you want to drive transactions and revenue? Save on customer support costs by replacing human staff with automated solutions? Provide highly personalised brand engagement that boosts user retention? Or did you just get caught up in the hype of shiny new technology and aren’t really sure what your bot is for? Knowing what goal and metrics you’re targeting will help you hone in on the right audience, design the right bot functionality and bot marketing, and ultimately guide your users to performing the key interactions that drive your bottom line. Discoverability is very challenging for chatbots. Other than Telegram, none of the current chatbot platforms has robust search functionalities. In the meantime, 3rd party lists and directories are being built to fill this void. Since it’s free to be listed, it’s a no-brainer to submit your chatbot. The quality and functionality of these directories range from bare bones to full-fledged and some feature paid promotional opportunities. Some of the main bot directories are BotPages, Botlist.co, and the Slack directory. As with any other product description, how you describe your bot will either inspire or discourage users from engaging. Bot reviews and rating systems are few and far between, so your description is key to your bot being discovered, understood, and adopted. Make your bot’s functionality and utility abundantly clear for your target users. Here’s an example of what NOT to do for bot marketing: Scorebot’s description in Slack store is “Rule the office!”, which gives users virtually no useful information as to the bot’s functionality or value add. Compare that vague description with the more helpful ones of the two bots listed before it. Your bot name is one of the only pieces of information, other than your icon and a short description, that potential users see and use to decide whether to try you out. 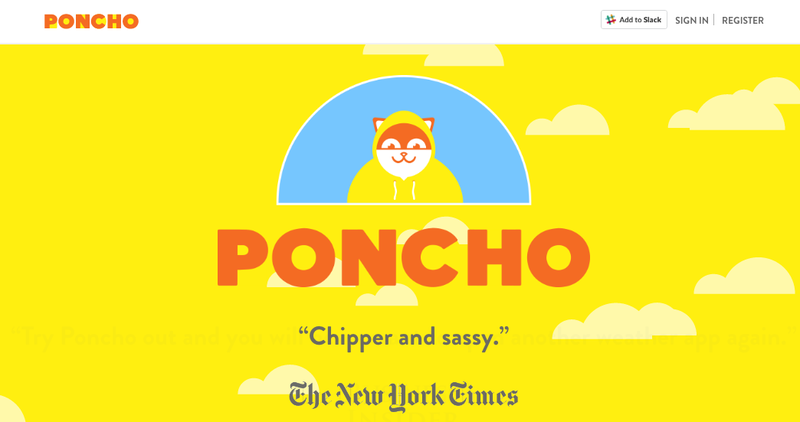 Furthermore, if your bot name is too generic, users might not be able to find you at all. This problem is particularly exacerbated on messaging platforms like Facebook that lump bots together in search results with real people, business, pages, and other content. 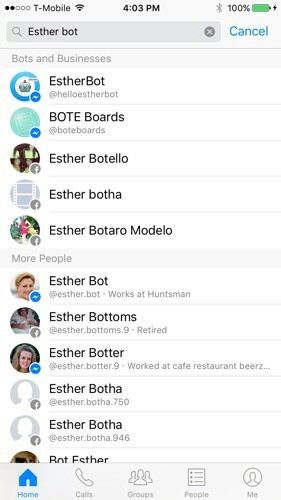 For example, looking for Esther Bot on Facebook turned up actual people named Esther Bot. As with any name, make sure your bot name is easy to spell, pronounceable, and ideally at the beginning of the alphabet. Also, try to avoid any brand and trademarked names as that may get you in legal trouble. Currently, on Facebook Messenger, search results lump Bots and Businesses together into one category, meaning a user can’t be sure if they’re messaging the human owners of a business, or an automated bot, or even just a random person with the misfortune of having a name identical to your bot name. Remember the Esther Bot example from the last tip? Facebook may fix this in the future with a clearer designation, but for now you should distinguish your bot from humans by either adding “Bot” or “Assistant” to the bot name or by having your bot clarify its role when starting a conversation with users. As with any product development, the first few iterations of your bot will likely have bugs or unexpected UX issues. Invite existing users to beta test your bot and share feedback. Users will feel privileged and you’ll get extremely insightful information. Treat this bot launch as you would any other product build complete with user research, testing, feedback, and constant iterations. Don’t have existing users that you can use as testers? Reach out to me at adelyn[at]topbotagency.com to learn more about our bot user testing services. Existing users aren’t just great for early feedback. They are often your greatest advocates since they’re already fans of your brand or business. Engage your most excited existing users with your bot, pay careful attention to their usage and feedback, and include in your marketing plan ways for them to easily share, use, and promote your bot with their friends. Messaging is an intimate act. People are used to messaging with friends, family, and loved ones. When inserting bots into the same platforms as these highly personalized conversations, there’s risk of businesses exploiting the interaction by overdoing sales offerings and spammy promotions. Pushy bots are not only a marketing nuisance for users, they’re also prone to being banned. For example, if enough users report your bot as spam, Facebook will automatically pull you from the Messenger platform. To reduce the spamminess of your bot, respond only when users have proactively reached out. Resist the temptation to send unsolicited messages just because you have a one-to-one channel open with your audience. There’s no need to make a bot for an entire brand immediately. You’re better off building a bot for a single campaign or focused purpose. Your company / website / product was perfected over a long time with many iterations. Your bot will be the same. For example, Sephora’s Kik bot focuses specifically on giving teenage girls beauty tips, rather than attempting to be a full e-commerce platform. Other bots focus simply on informing users of movie releases, without also trying to be a movie critic or a ticketing window. Trying to do too much with a bot usually leads to confused users, lack of adoption, and ultimately poorer results for your business and brand. Adelyn Zhou is a seasoned technology leader in the Artificial Intelligence and bots space. She has been recognised as one of the top 30 people to follow in AI, top 10 people in bots, and top 50 people in growth. She is a leader in the largest bot community of 24,000 members and organiser of the NY AI and Bot Meetup. She has been an invited speaker at conferences and institutions including SXSW, DLD, Launch Festival, Growth Marketing Conference, 500 Startups, Social Media Week, Harvard Business School, Columbia University, Cornell University, and more. She is a frequent contributor to VentureBeat, Forbes, Wired, Inc. and other publications. She is focused on connecting emerging technologies (AI and bots) for business applications.